Herald: On your mark, get set, go! After the much-awaited announcement of the dates for the National Games, the actual race begins now, as the State gears up to put up the required infrastructure in place to avoid any more slip-ups in an already tainted image. The ‘mark’ has been set after announcing the dates. Are we ‘getting set’? Not yet, probably. Will we be ready to ‘go’? Only March 30 will tell. Goa was supposed to host the Games in 2016, but due to unpreparedness, the Games had to be delayed and later postponed. The Games have finally found light at the end of a dark tunnel and are now scheduled to be held from March 30 to April 14, 2019. But are we truly prepared to host the Games? Unfinished stadiums, with some yet to see ‘On your mark’ ‘not getting started’, the situation at present looks uncertain. This air of unpreparedness raises the questions of whether Goa will be ready to host the games next year? Turbulent preparation is nothing new as Bambolim Athletic Stadium, Dr Shyama Prasad Mukherjee Stadium were completed and inaugurated just days before the Lusofonia Games in 2014. 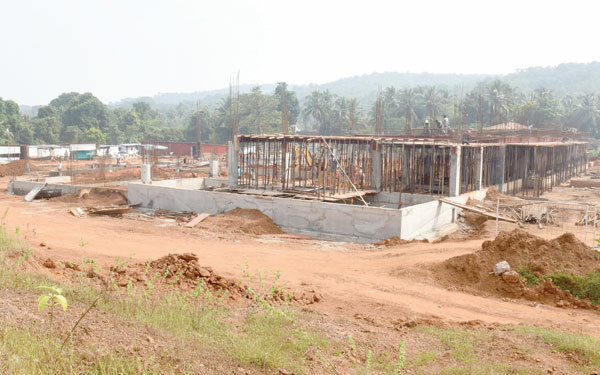 With over 35 disciplines to be part of the Games, Sports Authority of Goa (SAG) faces a stern test to host them at the 24 selected venues as at least three venues have given a project completion date of March 15, 2019 – just two weeks prior to the event. However, Sports Authority of Goa Executive Director VM Prabhudesai assured the venues would be completed well before time considering the work for the stadiums had begun. Hosting the National Games is an ambitious endeavor for any State. But with just five months to go, the State has a Herculean task in completing the stadiums as five new facilities – Indoor Stadium Savalwada, Hockey ground at DBKS Peddem, Indoor Stadium Navelim, Open Sports Complex PJN Stadium Fatorda, Squash Facility Chicalim are to be constructed which are estimated to cost approximately Rs 113.44 cr while many venues are still in tendering process. Hockey ground at Peddem, Indoor Stadium Sawalwada and Indoor Sports Complex at Campal are the three facilities wherein the work has commenced of which around 15-25 per cent work has been completed. While the hockey ground is likely to be completed by January 30, the Sawalwada and Campal indoor stadiums are expected to be completed by March 15, 2019. Meanwhile the files for refurbishment of the Multipurpose hall at Fatorda and upgradation of Squash court Chicalim have been submitted to the Finance Department for acceptance of tender. Some facilities have commenced the work while others are either yet to see their tenders floated or yet to begin the works. Only the demolition and dismantling of the existing indoor sports complex at Ponda is complete except for the roofing while the footing reinforcement work is in progress. However, the letter of commencement of the upgradation of squash court and providing other eminent facilities of international standards at Chicalim Sports Complex, Chicalim has been issued to the Agency and the work will start from October 15. The same is with the proposed development of lawn tennis courts at Open Sports Complex, Pandit Jawaharlal Nehru Stadium, Fatorda. The visit at Benaulim, Utorda, Quepem and Cuncolim football grounds showed no changes as the minor repairs and beautification works is yet to be taken up at an estimated cost of Rs 1.70 cr at all four venues. Given the fact the expected project completion dates for the Games facilities are mid-March, just a fortnight before the Games, where will the State athletes train and prepare for the Games. Will it be on the sunlit beaches or the spaces being readied for the airports? It has been learnt that the authority concerned has asked the various sports disciplines associations to conduct 90 days camp but if the venues are going to be ready just 15 days prior to the event, where and how the athletes will train? Many State Sports Associations (SSA) has expressed their dissatisfaction and raised this issue as a major concern which could affect the athletes and their preparations. “The stadiums and venues should be ready at least 90 days prior to the event as we have been asked to host a 90 days residential camp for the preparations of the game,” explained a member from a sports disciple, on the condition of the anonymity. “The athletes need to get the feel of their venues and if they venues itself are prepared last minute, how the athletes will gain experience of the event venues?” quested another SSA member. Whilst the State will be in a rush to beat the clock ahead of the Games, the Games wouldn’t have the Games Village. Describing it as ‘not feasible’ to have it in the State, SAG Executive Director had earlier made a mention of accommodating players in hotels during the 15-day event. Prabhudesai had mentioned that the players would be accommodated within a radius of 5-6 km to their event venue, which would make it easier for the players. However, this could definitely play a role in team as the State players would be scattered across the State. This particular act makes Goa the first State to do away with the Games village. But only time will tell whether the hotel facilities would benefit the athletes or the State. Post event, will Goans get to use the venues? Sporting events often lead to boost in infrastructure in the State. This isn’t just a statement but the fact that Goa had spent over Rs 300 cr on three stadiums built during the Lusofonia Games in 2014 and ‘their rare usage’ for the sporting events obviously makes them White Elephants. The Peddem Sports Complex, Dr Shyama Prasad Mukherjee Stadium and Athletic Stadium, Bambolim are clear cut proof of the same. Most of these venues are lying dormant and are only available to rich clubs or institutions due to the high fee levied on the usage of the venues. It looks inevitable avoiding them in future based on the past activities and facts. The construction of Sawalwada Indoor Stadium, which is 6-7 kms from Mapusa, would feature fencing and weightlifting games, but post Games, would the venue be ever used to the fullest?